In world war 2 if Australia was invaded the plan was to essentially give them Australia up until to "Brisbane line". New Zealand have always been our friends in time of war, but when it comes to sport, as soon as they play a team from the "West Island" (aka Australia), as soon as they cross the no mans land of the Tasman Sea, a switch is flicked. Their eyes get bigger, their arms get stronger, their pain threshold grows larger. Today the Brisbane Line will be tested. I thought the Brisbane-Perth game was great, but this might rival that match of the round. The Breakers easily accounted for Cairns at home earlier in the round, putting them to the sword and showing no mercy. I'm expecting the Breakers will have plenty of energy left in the tank and will go over the trenches early to press their advantage. The final stanza will decide this game. Brisbane have slightly more tired legs and I'm expecting Captain Abba to present terms to Captain Gibbo. Gibbo to face his Waterloo. Brisbane to fade in the fourth, Breakers by 4. This is the game I'm really looking forward to watching tonight. Are the Bullets legit? I suspect not but if they are they would want to get this game at home. Sunday night NBL action FTW! Nice colour coordination re: the uniforms. Looks like a div 3 social comp game. If you can't tell the teams apart you need to get your eyes checked. Blue vs blue is not ideal. I'm not sure I've heard Lemanis blow up that badly before. Even Lermanis got blue in the face with that timeoout. Thats the second week in a row,i've heard Lemanis let the F BOMBS go.Dont they have a dump button at Fox. Deplorable language from our National coach lol. Hoping NZ hold on and win this one. "All aboard the bullet train"
Oh no, it's going in the wrong direction! Heading towards the bottom four. The "Grand Finalists" are down by 20! Bullet Train plays the long game, how often do I have to say this? Hopefully the Bullets can keep this interesting. So, how soon can Joey come back to Brisbane? Ben he's off to Sydney next season. When is this Jap fella gonna get a go? Can't be any worse than Cadee? Richard looks to be finding his groove now. Lemanis now resorting to trash talk to opposition players. A Stephen Holt sighting, a real treat. Get Simon Kerle out of the commentary box onto the coach's bench. No time for Brisbane or their coach. lead would be 25 if it wasn't for Lemanis and Gliddon's monaing make every call go Brisbane way the last 6 minutes. If the refs continue to be intimidated then it wll be close. Lemanis even allowed to trash talk a player as he is trying to inbound. Flto me it felt like the crowd on the TV angles filled out a lot during that quarter compared to earlier in the game. From memory there was a game in Brisbane (may have even been a boomers) where the sections of the crowd that would be seen on TV were really empty and LK got people to move to fill up those seats so it would look better on TV. I wonder if a single polar thing happened today? For all we know though some people may have rocked up late of just moved on their own lol. More horn than me at 6am every. Single. Morning. That female referee is the shits. Didn't even cal that feet shovel. Yesssss!!! That women screaming next to the camera needs the screen pulled around her. That chick in the crowd must be a Kiwi because she was seemingly trying to put off Gibbo on those FT's. ROFL, tight game after a fluke three by Gibson off the glass. Gibbo knows it's a contract year for him. Perthworld, I saw it with Gibbo at the Sixers he would always pull his finger out in the last year of his contracts. I noticed that too. He just does enough to stay in the league. And there we go Gibson three to level it. Gibbo says get the chequebook out. Webster should have been unsportsmanlike. Tragardh lecturing us fans that we shouldn't complain about no Saturday night games because we have a triple header today. Who the f**k does he think he is? STFU we're the fans and we know what we want. Interesting tidbit re: cheating back in the day with televised timeout huddles in the last two minutes. Buzzer beater by Abercrombie. Nice. WTF is wrong with NBL TV? Woot. $2.20. Shame NBL TV is farked. Good idea by Patterson. Too bad Gibbo was on the end of it. bugger, poor bullets. Great game. They were right at the end of the track pulling into the station and derailed just before the platform. Great game, good commentary, still need Saturday night game though. Now you see why I'm so big on Brisbane. That was a special comeback. Perthworld, you understand there is only one train. The train derailing means the season is over. Pretty clear. There isn't a different train for every game. Do brisbane hang a banner of all their current players in the stadium? How weird, surely that is reserved for championship banners and retired jerseys. Quality of the feed is terrible as always? Superb quality for me, as always. thought it was going to be a tech on Webster till I saw the reply and was just a reach in - was a foul but terrible flop - Then Brisbane could have won it at the end but again he decided to flop - if he stayed calm I reckon he may have scored. How the hell does the shot clock work all game but stops working with 14 seconds to go, when the away team likely want to see it... ! and agree with the above - that screaming woman should have been thrown out ! Commentators were right, should of been 0.6 seconds left on the clock for Brisbane. Are you watching desktop or mobile? "Perthworld, you understand there is only one train. The train derailing means the season is over. Pretty clear. There isn't a different train for every game." Manu, a train network has various stations which terminate at the ultimate destination. 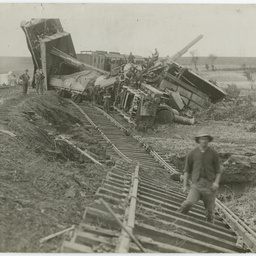 The bullet express has derailed just before reaching two of them during this round. There are of course many more stations to come, buta third have already been traversed. They'll be back chugging along next week but the damage down the track from two derailments may be irrepairable. Time will tell. Never have trouble with nbl tv either. Why is everyone saying 'Poor Brisbane'? They have only themselves to blame for letting the first half go like that. I stopped watching at half time to go do gardening, my loss. "Commentators were right, should of been 0.6 seconds left on the clock for Brisbane. " These derailments have been minor, so the train has been able to be put back on the tracks to get to the next stop. Come on Manu. and these two minor derailments may cause the inevitable irrepairability down the track of not even making it into Top Four Station. Speaking of trains, could someone throw Cadee in front of one? You reach, I teach. Bullets G-Finalists. I see where you're going with this, I really do, but I see a flaw in your argument too. Your description of said train has a sense of inevitable conclusion to it. The damage is either irreparable, which means the train does not meet the standards of the Australian Locomotive Association of Australia and will thus be decommissioned and stripped for parts, or it does. If it does meet the standards then it will continue its journey unmolested and is subject to only routine weekly checks just like every other train. So your argument of there being a potential for termination of the service 'down the track' is wrong; the train is either fit to be commissioned or it is not. And seeing as there are guaranteed stops ahead, as soon as next weekend no less, the train has not been decommissioned. That is under your premise that the train has in fact derailed, which is actually up for debate. I don't think it has derailed. I know so much more about ALAA statutes than you, it'd make your head spin. Jason Spudee another awesome game of sub 30% shooting. Way to take something figurative so literally. Rename yourself The Fat Controller. I'm using this from now on. How about Crashee? Too soon? Breakers starting to find their groove despite almost grabbing defeat from the jaws of victory in this one. Nice they held their nerve and took the W they deserved. By being 'figurative' you just open yourself up to loose, incoherent narratives. If you don't care about the integrity of your stories, go right ahead. In Perth, Holt was as bouncy as I've seen him this year and he made an impact. I think they should just start him at point and see how it goes. Been thinking that for a while. More issues with scoreboard and timing at Brisbane game. when will NBL get it right. Is it the people or the tools available to them? Last play was messy but Breakers came through with deserved win. Flat spell in Q3 was troubling. Brasswell had wrong team on floor and scrimmage play was exposed. Huge game for Richard. Webster was not the money player we needed at prime time. Ili made two huge plays down stretch and should have had ball in his hands for final play. Breakers are a hard team to peg, contender or pretender. Long may be the key! He is an instant foul to anyone driving within 2 feet of him. Time to work things out, I suppose. Feels like every team except Perth is Jekyll or Hyde this season, but maybe not to the extreme of NZ though. Breakers to me are in similar territory to the Kings where it feels like the roster has the talent to succeed, but is let down by the coaching. Talent will get them wins, but I don't see them living up to their potential with Braswell at the helm. Can't help but notice you don't have a retort. Taking Ls like the Cats will in the semis. So good. Keep chirping. I've been a gentleman so far by not linking to the post where you spectacularly backed down from putting money on the line after suggesting it. Classic. Dig it up, bold it, blockquote it, write it in all caps, write it spongebob meme style, underline it. Pride must mean nothing to you. You think I'd exchange money and personal information with a shady West Australian anyway? Deluded. Just like Tasmania, you guys are so far away that you've become an afterthought. Just keep going. Would Indonesia even want you? So far away? But we're the centre of the NBL universe! It's actually Melbourne. Literally and figuratively. According to the box score, Brisbane suited 13 players for this one. Max is still 12, right? Brisbane to beat United on Sunday, the thousand is down. "Brisbane to beat United on Sunday, the thousand is down."